The following information was taken from the Thursday, September 20, 2006 Wayne County Scrapbook section of the Sun and Record by Brooks Tenney. 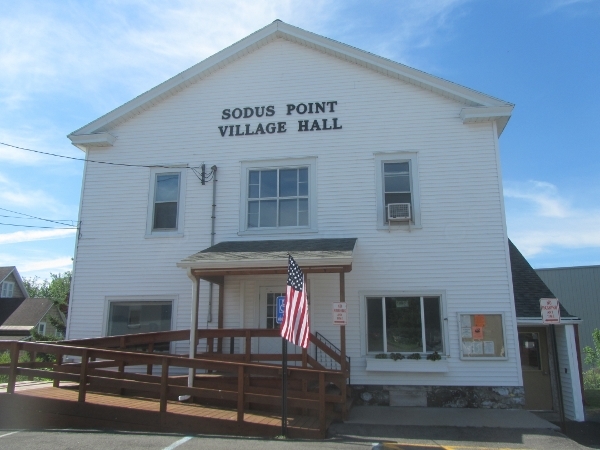 Unless you’re a senior, you may not know the Sodus Point Village Hall by its original name. This much-modified building has seen use in three centuries. The building originally known as Guild Hall was built by the ladies of Christ Church (Episcopal) in Sodus Point at the end of the 19th century. Christ Church in Sodus Point dates from May 3, 1851, half a century earlier. The frame building for Christ Church in Sodus Point stands at the edge of what was once a town square, bisected by the Lake Road. At one time the Rochester and Sodus Bay R.R. (trolley line) ran down the center of this road; today’s Bay Street. In 1884, female members of Christ Church formed a Ladies Guild. Their first meetings were held a few doors away, in a structure called Lummis Hall. Today Lummis Hall is better known as St. Rose’s Chapel. The ladies of Christ Church held fairs, and other events, including ice cream sales, to raise money for the erection of a parish house. The purpose of the parish house was for “holding guild meetings, fairs, concerts and entertainments and also to furnish a place for the young people, regardless of denomination, to gather for all innocent amusements and recreations.” Guild Hall was begun in 1892 and completed in 1893. The era, between the end of the Civil War and the beginning of World War I, was a time of general prosperity and technical innovation, in this area and over much of the northeastern U.S. It was a period that witnessed the formation of many civic clubs and fraternal organizations; including such groups as the Maccabees and the Grange. The Guild Hall reflected a prevailing desire to serve the community while providing recreation for members of the parish. As the parish approached its centennial year, (1951) Mrs. Owen Merrill and Mrs. Raymond Balch, both of Sodus Point, prepared a History of Christ Church, which provided this description of the Guild Hall, still in use after a century and a half. After Guild Hall was completed, it was occasionally rented out for use by “traveling troupes, societies, dancing schools, and elections.” During the timeframe of the hall’s construction, a debt of $1,450 had been incurred, but funds realized by renting the hall were used to reduce this debt and all liabilities were discharged by April, 1900. 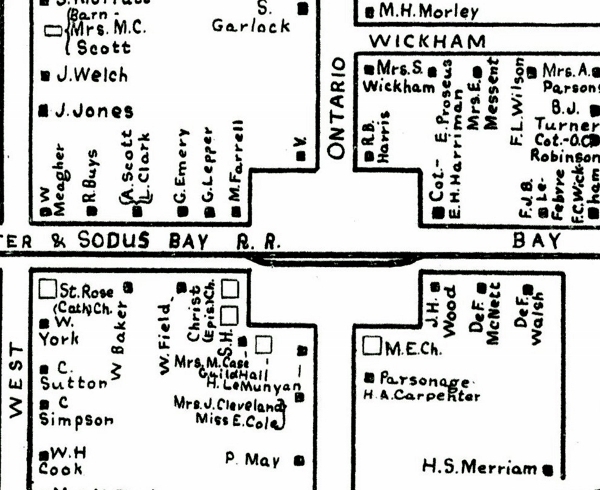 In 1901, Lewis H. Clark Jr. edited ‘Sodus-1901, An Atlas and Directory of the Town of Sodus and SodusBay.’ This atlas contains a map of Sodus Point which identifies ChristChurch, a Sunday school to the south and the Guild Hall. Both St. Rose (Catholic) and the Methodist Church (M.E.) are also shown. The Sunday school was later used as an elementary school. According to the Christ Church history mentioned earlier, the congregation grew to about 40 by the end of 1918. By 1931, this number had grown to 70. Over the years Guild Hall underwent a number of changes. Sometime in the mid-1950’s—perhaps ’54 or ’55—the building was sold by the church. Mr. John Buzzell, the new owner, converted the old structure into a laundromat. After several decades of operation, that business languished. Village Clerk/Treasurer Dorothy Tiffany confirmed that in February 1982, the structure, much modified and then owned by the Buzzell family, was sold to the village to begin a new life as the Village Hall. Some local residents still remember Guild Hall from an earlier time when it hosted dances, concerts and other community activities. Old photographs, possibly languishing in musty albums or dusty attics, are sought by the Sodus Point Historical Society. If you are harboring any of these relics of a bygone age, perhaps you might consider sharing them with our readers and the Society. Thanks to Jo Ellen Arney for a “heads up” on this topic.